I am a lacto-ovo-pescatarian, but I tell most people I am vegetarian, because, well, it's a lot easier. Being a lacto-ovo-pescatarian means I eat/drink milk, eggs, and fish products. With that being said, I don't make hamburgers in my house. They just don't exist because I do not eat them nor do I enjoy cooking them. My poor carnivore husband suffers (insert incredible sarcasm because I still make him deliciously healthy food). Although I may not make burgers with beef or turkey, I love making burgers from salmon. I have an all-time favorite wasabi salmon burger recipe that I will share in the future, but for now, I am sharing this ginger salmon burger recipe. The spiciness of the ginger mixed with the creaminess of the salmon goes together like peas & carrots. What makes this recipe really stand out is the fresh ginger. When I was a kid, anytime I had a stomachache or the flu, my mom would give me Canada Dry ginger ale. No, not Vernors, not Seagram's, it had to be Canada Dry. To this day, my love for Canada Dry when I am ill is still there. Now that I am all grown up (some days, kind of), I realize that my mom, giving me ginger, was the right thing to do. Mom's always right, right? Ginger has been extensively studied for its effects on digestive issues but, it's also been studied for preventing cardiovascular disorders, and diabetes. Any time you can add ginger into your diet, do it! And the next time you need something to calm your stomach, try something with ginger in it. Without further ado, let's get down to the ingredients. In a food processor, pulse 1 hamburger bun until it is crumbs. Transfer to a plate. 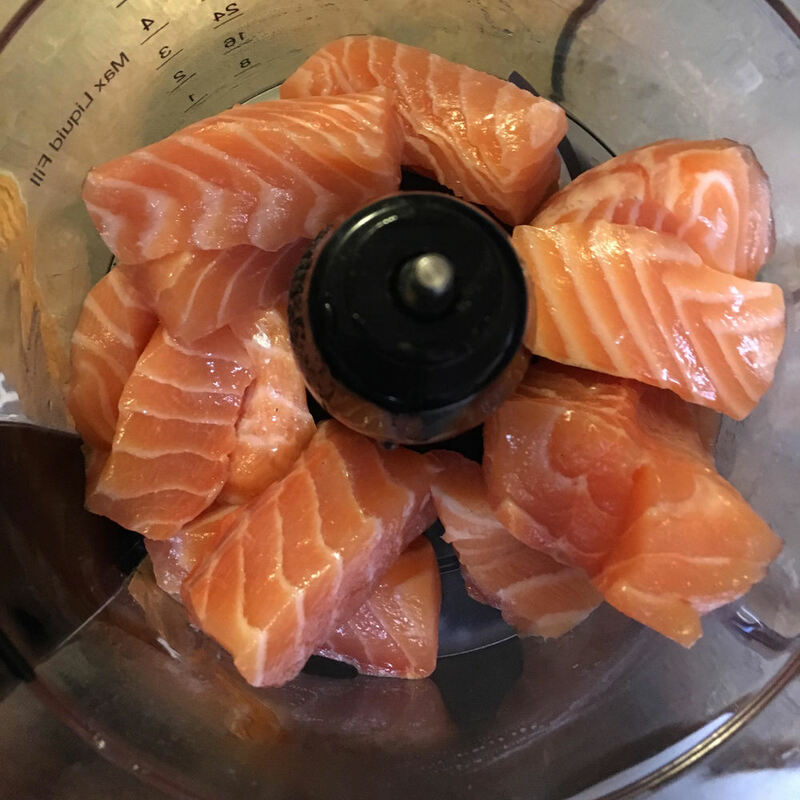 Add salmon chunks to the food processor and pulse a few times until it is chopped but not pureed. Transfer chopped salmon to a medium bowl and add 1/2 cup breadcrumbs, fresh ginger, mustard, and green onion. Mix. Form mixture into four patties and coat each patty in the remaining plated breadcrumbs. In a large skillet, heat olive oil over a medium heat. Add patties and cook until golden brown, about 5 minutes per side. Serve burgers on (gluten free) hamburger buns and top with desired condiments. Enjoy!